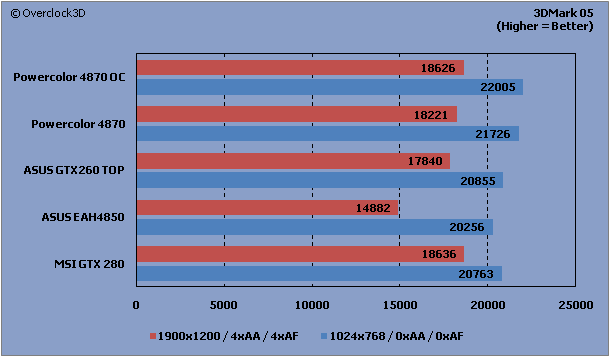 3DMark05 is where ATI generally thrives and as we can see from the graph above, the PowerColor HD4870 leads the pack. 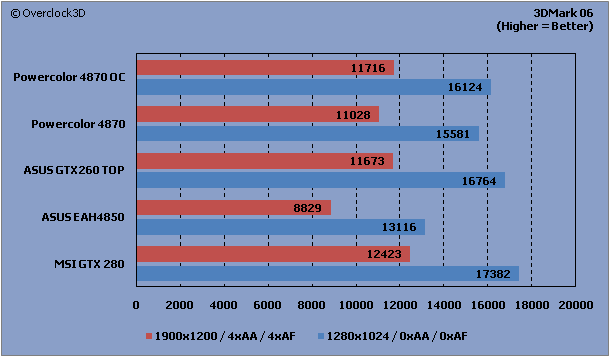 Managing to beat out the GTX260 with ease and even jump ahead of the GTX280 at both resolution settings, the 4870 is certainly an '05 benchers card! Moving on to 3DMark06, the results become a little more true to life with the HD4870 sitting a little over 1000 points behind the GTX260 at 1280x1024 and around 500 points when the resolution is increased to 1900x1200. However, this gap disappears with the HD4870 running at overclocked speeds and the card just manages to take the lead over the GTX260 at 1900x1200. 3DMark Vantage is one area where the red team certainly can't compete. 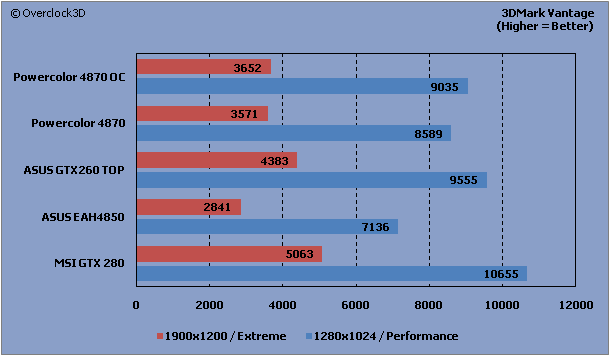 Even with the HD4870 running at overclocked settings it just cant match up to the might of the GTX260 in either Performance or Extreme modes.